Per, Jeanette, Beri, Concord Club president Dave, and our president Kathy. Jeanette Lohmann Poulsen was inducted by past president Beri Kasper at our joint meeting with the Concord Club on 9/8/17. Jeanette, her husband Per, and her 2 boys, Thor 3 ½ years old and Storm 16 months old moved to the states in January of 2015. They moved to Concord in June of this year. Prior to moving to the States Jeanette was a process supporter helping people diagnosed with Hemophilia. She is passionate about helping people in many ways…either directly or indirectly. She has a Bachelors in Global Business Engineering and a Masters in Management/Sustainable business leadership. She studied in Copenhagen, as well as Germany, and Sweden. 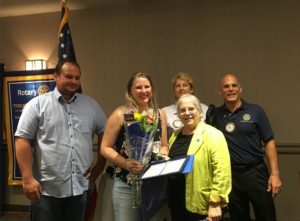 Jeanette was a member of the Copenhagen Morning Rotary Club where she loved participating in projects, being social, and as a board member…influencing the direction of the club. A few of her favorite things are Pistachio ice cream, all kinds of foods, reading, travel, family time, shopping, and giving her sons lots of experiences including gardening and traveling. Jeanette is sponsored by Lee Koellermeier. Welcome, Jeanette. We look forward to getting to know you and your family better! Previous Previous post: 2017 Pancake Breakfast a Great Success! Next Next post: There Were Princesses Everywhere!